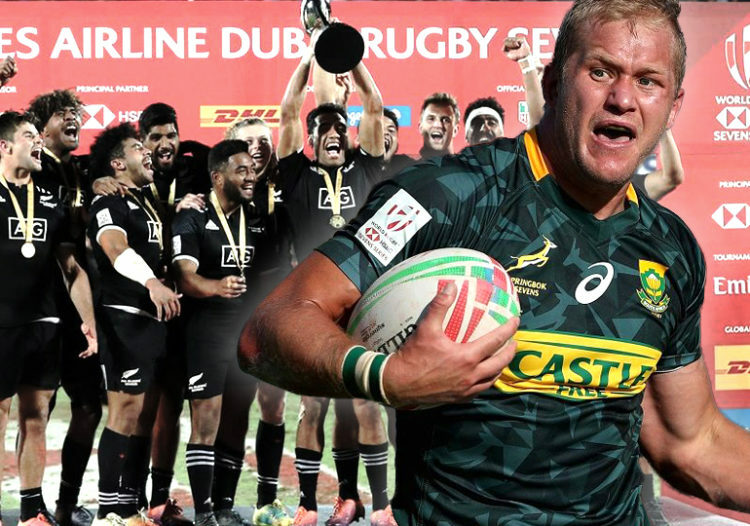 The Blitzboks will be desperate to return to winning ways after a disappointing sixth-placed finish at the Dubai Sevens, but the Blitzboks’ bounce-back has become a much more difficult mission with the news that they’ve been drawn in the same pool as New Zealand for the Cape Town Sevens. While Muller du Plessis finished as the leading try-scorer in Dubai, his seven tries were undone by South Africa’s porous 64% tackle-rate, no doubt top of Neil Powell’s snag-list for this week. The second stop on the 2018/2019 World Rugby Sevens Series marks the fourth occasion of Cape Town Stadium hosting a leg, with South Africa clinching the Cup in 2015, reaching the final in 2016 and settling for the Plate last year, en route to the 2017/2018 Series title. But where last year’s anti-climax at home followed a season-opening Cup victory in Dubai, the Blitzboks returned from the desert on Sunday with a deep thirst for some shiny crockery. A pool-stage loss against Argentina in Dubai, followed by a reverse against England in the quarter-finals and then an extra-time defeat against Fiji in the playoffs, consigned South Africa to sixth place. Defending World Rugby Sevens Series champions, the Blitzboks must now rally to face the reigning Rugby World Cup Sevens and Cape Town Sevens champions in the last of 24 matches at Cape Town Stadium on Saturday (kickoff at 19h56, limited tickets available). Earlier in the day, the hosts will take on Samoa and Zimbabwe, while the other highly anticipated clashes on Saturday see England face Fiji, the USA take on Argentina and Scotland square up against Wales. The only shining light in our dismal SA rugby landscape has been dimmed somewhat but these guys are too good to be put down for long. The other teams have upped the ante and we need to respond better and fast. One can still be positive about our proud Sevens team unlike their XV”s brothers who remain on the road to nowhere under the current hierarchy. I’ve always said we have plenty of talent in both formats, we just need a world class coaching set up without political interference to regain our pride in the XV’s game. Cheers. -the players have great skills. -we did not need a lot of phases to score like New Zealand and Fiji. the Boks have that too but they not skilled enough to do it consistently. Fiji should be dominating Sevens like New Zealand in 15s but they lack consistency. they have the Physicality, vision and they can run but do not turn up in every match. now the Boks i believe should also be dominating the 15s but they have the problem of their own. -we have the players year in year out. -we know how to win even with the most boring game plans. we use defence as the game plan. -we stuck in Jake Whites winning recipe. we are not looking for new ways. we are not pioniers which means we will be left behind. -the way we play always keeps us hoping that our players can dominate the world because they do win and we see glimpses of their greatness. so we keep piling hope upon hope and never getting there. if you put a great white Shark in a pool it only grown to a certain level. but when you put it in an ocean it grows to its full level. The Boks are playing in a water pool not in an ocean. since 2004 they have never played to their full potential. Just think of what we did to England in that first test when we turned our mentality to Attack. the coaches are to be blamed. except the Lions and Blitzbok coaches ofcoz. the numbers prove them innocent! Well said Nezo. Yes the real problems in our rugby are fixable but we need a total change of heart from everyone. Had to laugh during the BAA Baa’s match at how inept the Boks were at playing expansive rugby. Pollard looked particularly at sea. Until we weed out all those coaches and players from the system who are born and bred domkraggers we will continue to stumble through from game to game. Sad state of affairs. Cheers. even the last Baa Baas game that had a lot of South Africans was so poor. they made me so sick. and in that game we had the best of the Jake era. Sad state of affairs indeed. Ah, two Lions compatriots at arms. By the bye Nezo the 15’s back line coach is from the Lions, so that puts a bit of a hole in your bucket! Nezo has already pointed out the folly of your comment and the reality of our stunted Bok setup below here. Read it and weep. Cheers. Buzz off Albert, go and troll somewhere else! Ahhh Mr Barry, you funny. So is it with the Boks set up. you coach the backline to be able to attack then when you get to the Match. Erasmus tells them to scrap all of that and kick and chase. in that way, no matter who the backline coach is, they will never be good. bcoz you only get better in doing something if you practice it in real match situation consistently. so it’s not the Lions i Support since i am a stormers man. i support the truth. the Lions and Blitzboks showed us the TRUTH. that we can revolutionise our playing style and do better that New Zealand. Past 3 years results show that the Lions were equal to New Zealand teams in head to head. except the Crusaders. they have dominated Australians teams more that the Boks. the Blitzboks have been dominating New Zealand in sevens as if they were playing Germany. I just think we South Africans value our Opinion more than stats. stats = Evidence and Mr Herman has been preaching that for a while. i think its time we listen to him. then maybe Saru can also listen. us first. The tackle count was obviously an issue, but they also seemed a little light on X factor. I am sure they will be back. I wonder if Kwagga Smith is busy this coming weekend? You will have seen that Erasmus took along De Bruin to the Barbarians game, so it is clear that they are of like mind. You elude to Erasmus overriding De Bruin on attack, but really there is no evidence of that at all! If the Forwards don’t work the forwards coach takes the wrap and similarly the attack coach! Lions were strong under Ackerman, but they were thumped during Currie Cup and also by the Sharks at the tale end of Super Rugby and I suspect that will be the case in 2019! Herman has some valid points, but it is easy to sit on the fence and point fingures! He would get more support if he had some workable solutions to offer and not just criticism. I wasn’t able to watch that Barbarians game, -how did Schalk Brits do? The ‘Boks’ were plumb useless. Don’t believe me ? It’s not too late for you to catch it on many forums on the internet. A touch of laziness there old chap. See also my response to Barry below. Cheers. And once again you display the fact that you have not a clue about rugby, -probably never played a game in your life. The Barbarians culture is a week-long piss-up, its one big party with guys sometimes playing the match STILL pissed and hung over. Yet in this CONTEXT you try to compare a thrown together team, in party mode, to an International Team that has played together for a full international season. —-AND STILL BEAT THEM. Funny, the bit I was able to find all raved about Pollard and a few others, so please provide me with a link to a reputable source corroborating your assertions,—or did you just pull it out of the usual place,-your Rse? Our questions remain unanswered! Nothing majorly wrong, but equally nothing beyond Workman like. Barry you must be joking. The Boks ( 10 or 12 of them at one stage ) in the team were pitiful and your ‘nothing majorly’ wrong comment a serious denial of reality. Rassie said before the match he would be stupid to ‘over coach’ the BB’s. Some of those Boks are uncoachable in the expansive format and showed every bit of it on the day. Pollard especially looked like a fish out of water and further confirmed my argument that he is the worst flyhalf in the top 10 ranked teams when it comes to creative play. Dropped passes, poor passes, passing to the wrong supporter, no imagination on attack, poor tactical kicking ( Pollard ) etc, etc. Look how the Argies, who only one two games this season, played the game. Guess who the two were ? Yes the Boks and Australia.They insulted the BB jersey in fact. Are these things not obvious to you ? Festival rugby, no pressure and they lacked the instinct or skills for it. That is why the Boks are plumb useless under Rassie, win one, lose one, pox one, implode one. Cheers. 8 out of the run on 15 were Boks,—long way from 10 or 12. See, as soon as one takes a deeper look at your “assertions” it all falls apart. that line above summarizes everything. the LIONS have done it. all we need to do is copy and paste what they did. -Get Ackermans and the players involved in the Lions since the time of Spence. seat them down. find out what they did to change a REJECTED team to 3 times runners up in the Southern Hemisphere biggest club tournament. and plz remember these guys were rejected as worth nothing. – because they had a New Zealander to help them get very creative and skillful. i would say we should employ New Zealanders as Head coaches of our Varsity cup teams, currie cup teams and development side teams. give them full reign to do what they do best for the next 4 years with those teams. even on Super Rugby level if the african would be willing. -employ South African Coaches as Assistant to these guys so that they can learn from them. their job must only be to coach what we know. Scrums, lineouts, mauls etc. don’t get me wrong. our Coaches are good. but they need to be thought this new way of playing so that their mentality can change. – after all this is done we can give back the head coach positions to those South African Coaches who were Assistants so that there could be succession. -all our players should visit the Blitzboks training grounds and be put through the training of sevens by Powell and his coaching team. to improve attack. He must just put them through what the Blitzboks go through on every training session. after that training we need an unofficial tournament of sevens with every South African player involved. that will help a lot in skill and decision making development. Again well said. See also my response to Barry below. Cheers. “The Lions have done it” what have they done? They’ve been in the play offs the last three years, but so have theSharks! Neither team have come away with anything! There are very few if any international Coaches that would be interested in working in SA. There’s just too much baggage and the currency is an issue! You had Feeney in WP for two years, didn’t help much did it! Barry I agree your comment on overseas coaches not being interested in coaching here but only because of the unholy transformation imperatives. Scrap that ( which is doable if everyone opens their eyes ) and the rest will fall into place. Nezo has made some very good points as well. The only problem is you’re asking idiots with vested interests to change the system. However as for your Lions / Sharks comment well that’s way off course. There is a vast difference between reaching a Final or reaching the playoffs my good man. Even this year where the Lions were not at their best they still finished fourth on a TRUE log and according to most were deserved finalists. In addition they beat Argentina and a 10 man Wallaby loaded Waratahs team in the playoffs to get to the final. The Sharks true to form choked at their QF stage after sneaking in at 8th place on a 15 team log. In other words more teams made the playoffs than did not qualify. What a stupid system. Winning a Final in any competition in NZ is practically impossible no matter how good you are and the Lions made a good fist of it this year earning respect from the NZ press. The Emirates final last year was Jackass Peyper’s moment of madness which cost the Lions the title. Poor little feller overcome by the Kwagga / BB hit went all NZ on us and over reacted to the tackle with a RED. Here’s why I differ. Since that event there have been hardly any cases both here and overseas where the tackler has been red carded for that offence. A yellow maybe but not the ultimate sanction. They recognized the fact that two players hurtling at each other can result in an ugly collision in mid air and if there was no intent to play the player in the air a yellow maybe with only a penalty given at times. So a very unlucky Lions team had to bear the brunt of the Jackass. In the meantime the Sharks never even progressed beyond a QF in the three years. But let me just add this. The Sharks had some fine moments this season ( still too inconsistent though ) and were definitely the best of the other three which wasn’t very difficult considering how poor they were. Like the Lions they were ignored in the main by Rassie and Co. this season and some Sharks were very unlucky not to get the nod. Whether this will change next year is a problem as we have only four tests left before the WC. Rassie’s love affair with all things Stormers and Bulls has cost him this year and the chances of him changing tack next year is remote. Meticulous planner ?? Meticulous blunderer more like. Cheers. i really hope the Sharks can be consistent Herman. they were so good in New Zrealand. as you rightfully said the Lions and the Sharks were our best two sides. how on Earth did Rassie not recognise their players. am not really asking. am trying to make others question it. then maybe they will see the light. Jaco Kriel was injured, Du Preez brothers NOT BLACK enough,—-Context is always helpful. Uhm no Albert you take first prize, congratulations! The point is neither team had anything to show for their efforts! I hope that’s understandable? Just as an aside,—all the sevens commentators agree the Blizboks were successful because they had the BEST DEFENSE in the competition, so sorry,—-there goes your sevens attack strategy out the window. Look at their tries scored old chap or is that chump ? Ignorance is best hidden through silence. Cheers. Why dont you just read and comprehend what I said,–tooo hard for you? COMMENTATORS at the actual games said,-its easy enough, I heard it more than once, even in the loss to England at Dubai they were commenting that the famed defence from the previous year was lacking. Nobody said anything about tries. The Lions haven’t DONE it,—they have won nothing. You cant cherry pick stats when it’s convenient. Otherwise, a valid point would be, we ALMOST beat England, Wales, NZ twice this year so ergo the team is winning having ALMOST beaten the nr 1 team twice in one year. Just like Herman you confuse cause and effect,-let me lay it out for you. Attacking rugby is not the be-all and end-all in rugby, there are many teams over the years that played attractive attacking rugby and came NOWHERE,–I dont think you are as old as me but some older people may tell you about Eastern Transvaal, EP, Natal and Freestate rugby from the 70’s and 80’s. They could all beat a top team on their day and they all played “champagne rugby”.—–They all had the same problem, they could never maintain a team from one season to the next because as soon as they got good their players got “bought”,—–AND HEREIN WE SEE WHAT REALLY WINS CONSISTENTLY,—it is cohesion and continuity of players and coaching that allows you to be successful as rugby is one of the most team-oriented games on the planet,—and why FIJI and Islanders with superb skills and “attacking rugby” can never win the 15 man game consistently. So why, you may say have the Lions almost been successful these past 3 years? You alluded to it,—but like Herman misunderstood it. THE LIONS WERE SO CRAP 3 YEARS AGO NOBODY WANTED THEIR PLAYERS AND COACHES, -just ask yourself,- what are Ackerman’s coaching credentials in reality,—historically? So what actually happened is this, the Lions (quite by accident) managed to keep a group of players together long enough for them to build the necessary cohesion no other South African Franchise had the luxury of. Everybody else was losing players left, right and centre and had to rebuild every year. In the meantime, nobody was even looking at what was happening at the Lions so they flew under the radar and managed to build from one year to the next. Just by the by, this cohesion, continuity and succession is the exact same reason why Ireland and NZ WITH TOTALLY DIFFERENT GAMEPLANS are successful. AND IT IS EXACTLY WHAT RASSIE IS TRYING TO ACHIEVE. Skills, attacking rugby, mindset etc etc etc are all important but without player cohesion, they just result in dropped passes and players running around like headless chickens. Nobody is advocating Old School/Domkrag rugby (God I hate that word) but please understand what Rassie is trying to do and why he has been appointed Director of Rugby for 6 years,–it is to try and find solutions to the problems that cause us to lose all our IP from one year to the next. Rassie is quite capable of coaching attacking running rugby, in fact, he is one of the first coaches in SA to play running, attacking rugby. He is also one of the most innovative and studious coaches you will find, he was using video technology to analyse when Betamax was still a thing and “disco lights” to direct when everybody else was still using clipboards. As Freestate Coach he had them playing a beautiful game when the Lions were still trying to find a successor to Gerald Bosch and Louis Luyt was giving away gold watches to referees. Now that the Lions are out from under the radar and their players and coaches get stolen just like everybody else I guarantee you their “attacking game” will achieve nothing this year, as we could already see towards the end of last year and in the Currie Cup. My apologies if Capital Letters offend you but I don’t really care if people choose to get offended about inconsequential crap. SweetAz, What a load of codswallop !!!!. Why this Lions paranoia ?? They have been simply the best and the records prove it. Get over it old chap and read my response to Barry on the subject in the thread above this one. No point in me repeating myself here, it’s a waste of cyberspace. Your very first premise already shows your failure to grasp the other side of the argument. Who ever said attacking rugby must be the be all and end all and must be done willy nilly at the expense of all else. Certainly not me and I’m sure Nezo never said so either. There must always be a balance between all the facets of the game so what’s your real gripe ? Maybe it’s because the Lions proved it can be done while the other Franchises had every opportunity to do the same but still chose to follow the dom krag call. Don’t detract from the Lions, rather call out the failed Franchises. The only difference is successful teams play the attacking game better than the dom krag brigade brought up on no frills crap. When the time comes to attack they do it with aplomb and instinctively create try scoring opportunities. The pitiful Bok contingent last week playing for the Baa Baa’s only proved my point. They were inept and skill challenged across the board. A disgrace to Baa Baa’s rugby in fact. Sure CONTINUITY has it’s place but unless you have the right COACH and PLAYERS as well as an ALL ENCOMPASSING GAME PLAN you will only be tilting at windmills. Rassie’s record so far indicative of this. Continuity should not have been a problem with the Boks this year as Rassie could have built on AC’s team that lost 25 – 24 to the AB’s last year. Fourteen of those players in the squad played this year. Notable players missing that should have played this year : Andries Coezee ( more consistent than Willie ), Ross Cronje better than Papier or van Zyl, Serfontein ( better than DDA ), Jean Luc Du Preez ( better than Francois Louw ) so that’s practically a team already that Rassie could have built on. As for Rassie’s disco lights you mentioned, it actually became the laughing stock of the rugby world while you call it visionary, go figure. Laughter still heard on rugby stands across the country to this very day, lol. Methinks you shower Rassie with virtues he does not possess at this stage. FOURTEEN tests later and with only four tests remaining before the WC he will be sorely tested to keep the ‘quota’ lovers at bay while blending a hodge podge of overseas, local and ‘quota’ players with a game plan that most of them are incapable of playing anyway You do realize Wales out – domkragged ( love the word ) us recently so we are expansively challenged as well as D K challenged. Good luck to him. Your prediction of doom and gloom for the Lions is predictable I suppose but we will adapt as we have in the past. If we have to rebuild it certainly won’t take years old chap. The other Franchises have been trying to rebuild for 5 years now and still don’t cut it to this very day. How sad is that. Cheers. Pointless arguing with you, because you cherry pick stats, set up strawman arguments and deny reality. Your main problem though is rooted in Provincialism, an inability to see the potential in anything that does not come from the Toilet of South Africa, otherwise known as Gauteng. For your information,-in 2006 when the Freestate played the Bulls in the Final it was their THIRD successive Finals Appearance—DISCO LIGHTS AND ALL. I’m sure all the people laughing were Lions supporters who had an early holiday. Please tell me who Ackerman was coaching at the time because it was so inconsequential it slips mine and everybody else’s memory. Oh wait—-perhaps he was still serving his Nandrolone Ban,—-the big Christian Drug Cheat. No point in me repeating myself here, it’s a waste of cyberspace. After listening to Mr SweetAz i now understand why South African have struggled so much. they refuse to break from tradition even though results prove that its not producing excellent results. Mr SweetAz please read what Herman said below. but now am not even trying to convince you because you have shown that you refuse to see the point. The Blitzboks have already peaked IMO. The cracks were starting to show at the end of the last season already. They will be in a rebuilding phase for a bit because of the loss of so many key players to 15s rugby and retirements. Think about Senatla (over 1000 points), Ruhan Nel, Kwagga Smith, Tim Agaba, Cheslin Kolbe, and Specman (also on his way out now to 15s). You don’t replace those kind of players overnight. Anyway, one tournament doesn’t determine the season and it can quickly change. No man, all they have to do is attack, attack, attack. Cohesion and continuity have nothing to do with it. then they should do exactly the opposite. A touch of sarcasm, I suspect eluded you!